That’s a question asked recurrently in therapy. By teenagers struggling to define themselves. By 20-somethings trying to find their path in the world. By midlifers who sense that life has somehow gone astray. By people in long-term relationships, wondering how much of them is really dictated by their partner, or adopted via some never-discussed negotiation. A central part of the question is the distinction between elements of the self that come from within, and elements constructed as part of a socially acceptable act. Part of a therapist’s job is to hand the client sharp knives with which to dissect their concerns and experiences; ways of turning random observations into genuine insight. These knives often come in the form of questions, metaphors, and stories. When questions of identity and one’s future course come up, I have returned again and again to a question posed by one of the most insightful and interesting people I have met or whose books I have read: Quentin Crisp. 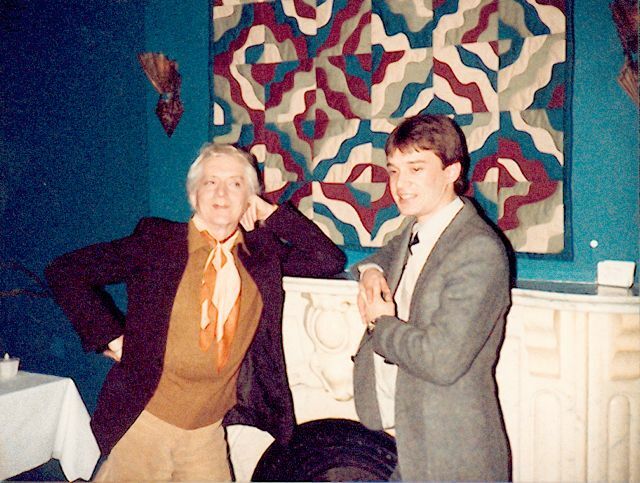 Crisp was a flamboyantly gay Englishman employed for much of his life as a model for government art schools in Britain – a profession that provided the title of his autobiography and the subsequent film: The Naked Civil Servant (in which he was played by John Hurt). He survived the Blitz in World War II and the distinctly disapproving social environment of midcentury London and in his early 70s abruptly moved to New York City, where he knew next to no one. Over the next two decades he became a fixture of the city, appearing repeatedly on David Letterman, performing on stage (especially in his one-man show An Evening With Quentin Crisp) and in the odd film (for example, as Elizabeth I in Orlando), and writing a dozen books about his life and philosophy. He is the subject of a well-known song by Sting (An Englishman in New York). He died in 1999 at the age of 90, about to open a run of his show in his native England. It’s no good running a pig farm for thirty years while saying, “Really, I was meant to be a ballet dancer.” By then, pigs will be your style. The very purpose of existence is to reconcile the glowing opinion we have of ourselves with the appalling things that other people think of us. I met Crisp in the mid-1980s. One of my very few “brushes with fame” stories is that I briefly appear, unnamed, in one of his later books. Behind the makeup and hair dye was an astute intelligence and a determined adherence to a rigourously individualistic perspective on life. His views and insights are legion, and some have found their way into my clinical work. If there were no applause and no criticism, who would you be? Crisp’s question is a classic of counterfactual thinking. It invites us to imagine a world in which nothing we do can possibly attract the love and approval of others, and nothing can trigger their displeasure. In this imaginary world, what might govern our behaviour? Motivation would have to come from within, and be produced by our own interest, rather than our desire to impress or escape disapproval. Notice what Crisp doesn’t say. Once you’ve figured out what you would do on his imaginary planet, he doesn’t order you to act on your insight as though you lived there. His question is designed to clarify your options, not to prescribe one over the others. The truth is, we live in a world of applause and criticism, and at least some of our behaviour will always be governed by the hope and fear they create. But knowing why we do things enables us to make our choices more consciously. I can know that I am choosing accountancy to pacify my parents and no longer have to pretend to myself that I have an intrinsic interest in the field. I can see that going to the office party is my effort to avoid the boss’s disapproval; I do not need to feel guilty for not enjoying it more. Crisp wrote that the one thing that most people have that is truly theirs is their individuality, and it is the one thing that many people most want to be rid of. His was an extreme example of living as an expression of self - one that might be beyond many of us. But his thoughts and writing on the issue stand as a monument to the idea of separation/individuation. And his question has proven to be a useful tool for many of my clients. In which book did you make a cameo? Good question; it's been so long since I looked. I believe that it was Manners From Heaven. I'm not named, except as a "young man" that he met on a journey (in the picture above) and who commented on the unusual fact that he was travelling to the place I met him. I have read three QC books, but not Manners. His books are terrific although hard to find. Maybe Changeways could buy the rights and bring QC books back to print! Where was the place that you met him? Why was it unusual to travel there?